One might say carrying all that weight of a ladder and tools by one man will be hard. It is hard work, however, with training quite manageable. This is job isn’t easy. What we can do is come up with some ideas on how to make our tools work for us. There are many different type of ways to get the tools to the fire ground in a timely manner. We can hang tools from the ladder; put them in Truckman’s belt, or just by using your hands. All have their advantages and disadvantages. Add in carrying a ladder and things become just a little bit harder. But with pre-planning we can make our jobs easier. We can use the “ladder on ladder” method. It entails taking the 16 foot roof ladder and opening the hooks, making sure they are pointing up. Then, you take the 24 foot ladder, bed side down, and place it on top. You can now grab the 16 footer and drag both ladder and an assortment of tools with you to the fire ground. One fireman can drag 2 ladders and 3 to 4 tools efficiently. We must become intimate with our ladders. You need to know were they are on the rigs, how to deploy them fast and efficiently, and what their limitations are. Knowing what our ladders can and cannot do is vital in our operation. When cleaning and inspecting your ladders find out where the balance points are, if the halyard is bad or tangled up. On the roof ladder, find out if the hooks can come out easily. Find out how the ladder will react on different surfaces and what angles are good on those surfaces. Take some company pride and display your number on the balance point so others know that those are yours. But most importantly train with your ladders. 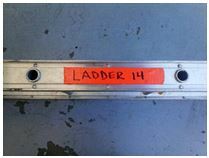 Lets face it ladder training can be boring, but it doesn’t have to be. It doesn’t have to be nice outside to throw one against the wall or practice climbing one. Use your truck bay, throw it, practice climbing it, moving it and getting it down. Find out your strengths, as well as, your weaknesses with the ladder so at 3 a.m. there are no surprises. Recent training provided to us has proven the beam raise is the best way to quickly get a ladder to a window for victim removal. Now are there applications were the flat raise will work, yes of course. With that said as the “throw guy” (the firefighter that is getting the ladder up to the window) must keep his body to the building, and their eyes on the prize. This is not the time to be sizing up the building, looking for power lines or other hazards. That should have all ready be done when you got off the rig, and approaching the building. Your eyes should be focused on getting the ladder to the window, and more importantly to that victim that is relying on you. You should be looking at the victim, and thinking what that victim’s state of mind is. Find out if they are clutching a baby. Size up the window with your body to the building. When the ladder is being thrown, have it on your outside shoulder walking it up. The “foot guy” should hold most the weight of the ladder as you throw the ladder to the wall. This will keep the ladder out of your field of vision of the building and keep your eye on victim. This is very crucial. If the victim doesn’t see you looking at the window, they might do something tragic like jump, or drop their child. Most of the time on a two story residential house, the 24 foot ladder will reach the window sill but with little play in the effective angle at which a rescue can be made. It still can be done, but will require some more work. So as a rule of thumb, use the two click rule. 2 clicks and ten feet away from the building is a great way to get the ladder at the angle that’s just right for rescue operations. Rescuing a firefighter that has become trapped or disabled somehow near a window can be very taxing, especially with limited manpower. The Denver Drill is great but sometimes can’t be achieved due to manpower problems or other factors. Like I said early knowing the limitations of your ladder is very important, as well as knowing what your ladder CAN do. If the victim is near a window a RIT team can get them out by using the 16 foot roof ladder. First, you send a firefighter through the window and located the down firefighter. The window firefighter puts the ladder through the window, feet first. The inside firefighter then puts the downed firefighter on their side on top of the ladder. The inside firefighter then signals to the outside fighter that they are ready to get the downed firefighter out. 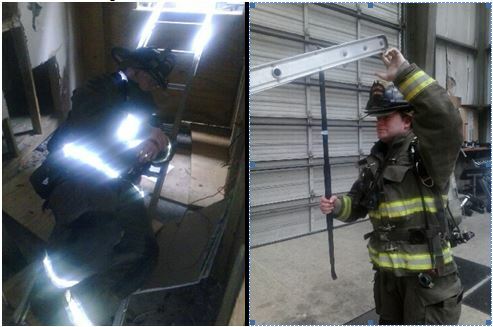 The inside pushes up on the ladder as the outside firefighter pulls down until they are level. (If the outside firefighter can’t reach the ladder, they can use a hook to pull down the ladder) Then, the outside firefighter pulls the ladder as the inside firefighter pushes the ladder. You may need a third firefighter or fourth to help get the ladder from window sill to the ground. This is just another unique way your ladders can be used on the fire ground. 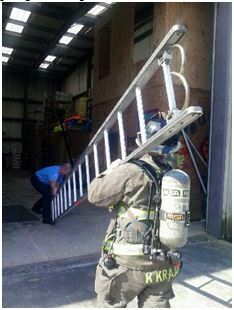 Having ladders on your rigs means you must train with them as you do any other important tool on the truck. They are just as vital to fire ground operations as a Halligan and axe. Get them out of the rigs, knock the dust off them, and see what you can do with them. Raise them, lower them, move them, and get to know them. Your victims and brothers will depend on them one day. This entry was posted in Truck Company, Uncategorized by countyfiretactics. Bookmark the permalink. the time and will agree with whoever they feel is the most dominant personality. You can use what you learned to improve your leadership abilities. You’re almost there, just a matter of time before you get to create content for your blog.